Hey. I’m Duane Redford. I guide fly fishers, speak, teach, tie flies, and write about fly fishing. Obviously, I like the sport. I’ve been guiding full-time/full-tilt for the last 12 years. Been fly fishing since I was ten, so for over 40 years I’ve been toting a flyrod. Previous to my guiding career, I was a teacher and coach in Colorado. 22 years worth. I loved it, but the tug from fly fishing (literally) pulled me in another direction. I guide out of Minturn Anglers, Minturn Colorado, on the Eagle River in the beautiful Vail Valley. Hope those of you that visit my blog will dialogue with me, because I’d like to include what you want to see and read. Also, please share this, if you think it’s worthy to other folks. I’ll try to update every opportunity. Til then, FEAR NO WATER! Uncle D. You should update this page, and add something about your book and where it is available, etc! Did! Thanks for the heads-up. Also, made another page just for the book. You can teach old dogs…. I have been looking for the illustration you mentioned but have not seen it yet. Send it to my email address, jeffmcclung@msn.com I will get on it as soon as I get it. Jeff, Happy trails! It’s on my phone. Tried to send it several times. Finally sent it via Facebook this morning. Let me know when/if you get it. May have to scan it to send it…. Duane, what sunglasses do you like? Scott and Cloud on the upper and middle end and Maxx on the more economical end. That being said, my optics are prescription, modeled after a Scott design. Either way folks go, I like the coffee colored lens. What kind do you prefer? Thanks Duane. I’m leaning toward the brown tint as well. Have tried some that come off yellow, which is ok for low light, but not bright sun. Still looking. Thanks for the tip. Love the book. Keep up the good work. Hey I am Sean I just met you in person at the fly fishing show on sat. I was the kid who talked to you. I just wanted to say that your te in my opinion the best guide that is in colorado you are patient and nice to your clients. Also I have always loved your style and how you fish. As a 14 year old trout bum that fly fishes colorado you are someone who I look up to. Your videos have helped me better fly fishing and sight nymphing the platte. Unfortunately I have never done a guided trip with you I am excited for that day to come. Also I see you a lot when I fish there but I don’t want to bother you and your client. I really want to fish with you in person and learn your skills. Thankyou again for taking the time to talk to me at the show with my friend. Not a lot of people would listen to a 14 year old trout un but you did and I thankyou so much! Thankyou! And have a wonderful new year! Yes, it was good talking with you and your buddy at the show. I am humbled and honored by your comments. Thank you. It’s always nice to hear of folks that benefit even a little bit from the stuff I post up. Gonna try to put up more videos this year, I miss it. Thanks again for your comments, and next time you see me on the river, with or without clients, stop by and say hey. I’ll do the same if I see you. From one trout bum to another, Fear No Water! I have read your book and think it is great. I live in Northern California and am planning a trip to Colorado this summer for a wedding. I was hoping to schedule a guided trip with you, but I can’t find your website or phone info. Can you please send me your contact info. If you can send it to my email address, that would be great. Great time fishing with you two. Not very often do we have a hook-up on the first drift! Can you shoot me your email please? Duane, what model reddington waders do you use? Haven’t worn them this past year, but the model I wore was the Sonic-Pro Stocking Foot wader. About $300 retail I think. Good durable wader, wore them for years. Big fan! Keep it reel! Haha! I enjoyed your interview on askaboutflyfishing.com. I have been keeping a fishing journal for about 60 years. I average about a hundred annually now. Your ideas made me think that I need to take temperatures more often during the day, esp when things change. I also need to review my journals more often. I am in the process of making a journal index so I can see what happened by date or water. I am going to buy your book. I like the Minturn shop. They rented me a rod and told me where to catch a bunch of fish this spring, close to the shop. Glad you enjoyed the interview, and hope you enjoy the book. Wow, sounds like you have piles of data! As a data geek myself, I’m jealous! Stop by next time you’re near Minturn, I’d like to meet you. I recently stumbled onto your videos very informative. I have been fly fishing for 20+ years but recently bought a drift boat. In the past couple of years I have started nymph fishing (suspension and euro) with great success while wading. When indicator nymphing I use the standard in line method you show. Now that I have been fishing from the drift boat on the south Holston and Watauga rivers near me my success has went south so to speak. I have went to 6x and 7x tippet. I have went with the size 20 and below flies. Still not catching fish the way I see other catching them. Hired a guide fished with him he seemed to use same tactics and flies and we caught way more fish. I have been looking hard into rowing making sure I am rowing properly for good drifts. Really just driving myself nuts mending more then wondering am I over mending. Not enough weight. Too much weight? Moving indicator up and down and changing flies. Constantly getting hung up and debris on bugs. I think what you said in that video made sense 1 1/2 times depth to weight not flies. That could explain why I’m deep enough to get hung up and get grass on my flies but not catch fish. You know the tippet is right. I know the bugs are right and small enough. So it has to be my drift or flies not at right depth. Any advice you can give would be appreciated. Anything you can offer me on your process of problem solving when your not getting bit what process you go through to solve the puzzle. I have tried to switch a bounce rig still not helped much. I am trying to envision the difference between your wading approach and your drifting approach. I’m not surprised you fare better while picking apart the water while wading, because your ability to fine tune your rig with multiple drifts is hampered by floating, as you often only get a few shots at a run. That said, you can still hook many fish with solid drift boat presentations. You may be dealing with a speed of drift issue. All else being equal, it’s sounds like a speed issue more than anything else. Have you compared the indicator to water speeds? It should be cruising at about 1/2 the speed of the surface water. 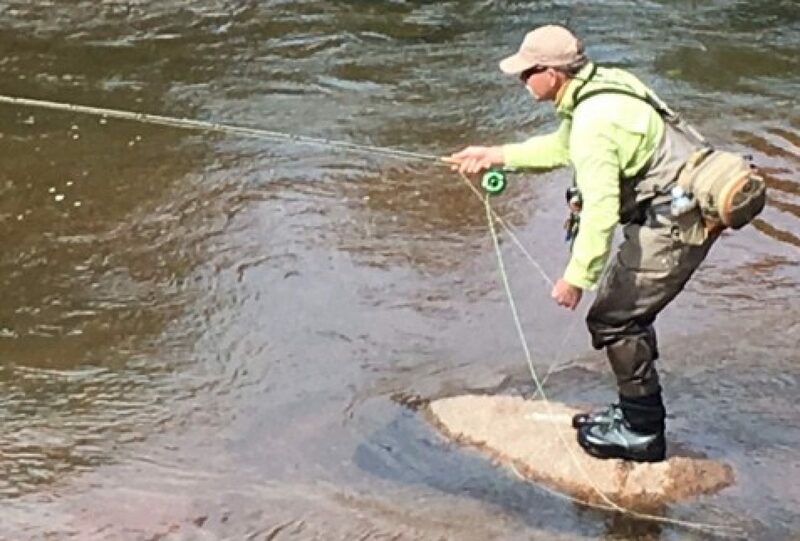 Take the same systematic approach when floating as wading. The transitions occur much faster when drifting from one type of water and structure to the next. This may also be an issue because your used to micro-management when wading. Think depth, speed, profile, color and try to set up to cover many different situations from the get go. As for going with the guide and catching fish, that hints to me that he may have hit a different line than you. Nothing big, maybe as subtle as a couple feet one way or the other. It’s tough to diagnose without getting a feel for your water. Please keep me updated on your process and success, because we both can learn from this. One question: have you tried the mini-rig in that water?